Howlers Inn is a unique lodging experience in the picturesque Bridger Canyon. 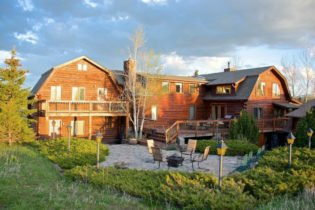 Located on 42 acres of pastoral land, near the town of Bozeman, Montana, our log home offers incredible views of mountains and rolling hills. Enjoy the romance of the mountainside with luxury accommodations and a variety of outdoor activities. Our family-friendly log home is a great vacation spot for children or couples. Each of the four guest rooms is uniquely decorated with rustic furnishings. Some of our guest rooms overlook the wolf enclosures, providing a front row seat for an evening serenade, and other rooms offer breathtaking views of the mountains. Guests will enjoy an array of amenities, including an indoor hot tub, Finnish sauna, pool table, outdoor playground, and much more. A delicious hot breakfast greets guests each morning before they start their day. Just a short drive from Yellowstone National Park, adventure awaits! Spend the afternoon hiking, fishing, biking, or horseback riding. 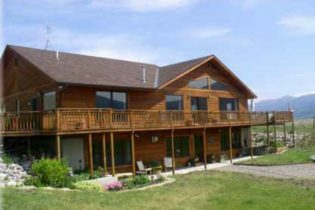 Johnstad's Bed & Breakfast and Log Cabin is conveniently located in Montana's Paradise Valley, surrounded by spectacular mountain views. The inn is 40 minutes north of Yellowstone National Park and just a short walk to the free-flowing Yellowstone River, known for its trophy trout. Great hiking & biking are also nearby. We offer 3 rooms with private baths in the main house, as well as a separate 3-bedroom Log Cabin with a full kitchen - perfect for families or groups of anglers. Enjoy the ambiance of our B&B in one of our three private guest rooms, each uniquely decorated and featuring an en suite bath. All rooms offer views of the Absaroka-Beartooth Wilderness. Our Log Cabin has 3 bedrooms and 2 baths, and includes a modern, dine-in kitchen, washer/dryer, and 3 decks. It comfortably accommodates 6 guests. Relax on one of the decks with a cup of coffee and enjoy watching the eagles soar or walk down to the Yellowstone River and cast a line to catch a blue-ribbon trout.